Custom designed and built vertical pull out shelves help organize your upper cabinet space. 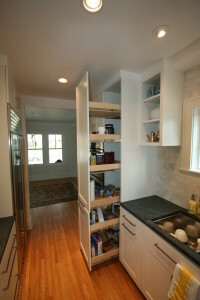 Custom roll outs maximize your existing space and make that space more accessible. 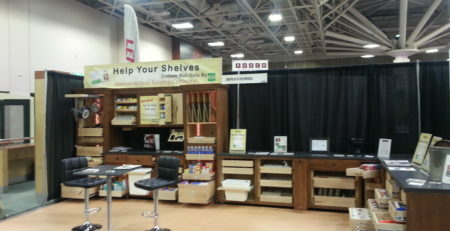 Help Your Shelves is part of Joseph Otto Enterprises. We are a custom cabinetry shop that realized not everyone was in the market for new cabinetry, but they still wanted to gain accessibility and organization in their existing cabinets. 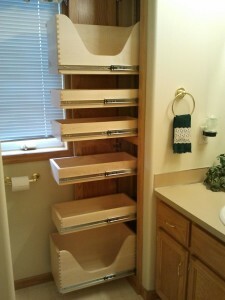 We use the same construction techniques with our roll outs that we use in our custom cabinetry. We have been in business for 12 years designing and manufacturing both roll outs and custom cabinetry and are located in Ham Lake. Our Process: We come to your home to discuss your needs and measure the spaces you wish to convert to roll outs. Then we custom build roll outs to your needs and dimensions (no standard sizes!). 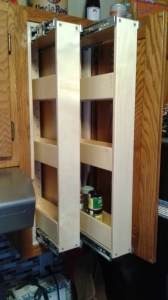 We construct top quality rollouts with solid maple dovetail drawer boxes that glide on full extension slides that are capable of holding 100 pounds. Once completed, we arrange a time to come back to install the roll outs. Installation usually only takes an hour or two with no construction on site. This means less mess in your home! Our Guarantee: We believe in quality and customer service, so we are proud to back our work with a lifetime guarantee. You needn’t worry about investing in roll outs. They will be custom built to your needs and our high standards. Joseph Otto Enterprises warrants that our Custom Roll Out Shelves are free of defects in material and workmanship for as long as the original purchaser is in the home. Within the period of this warranty, JOE will repair or replace, free of charge, any part providing to be defective. All warranty repairs and service must be prepared by JOE. This warranty does not apply to any cost, repairs, or services due to the misuse of the product. Our roll outs are $170 per shelf, no matter what size. includes the consultation/measure, build, and installation.